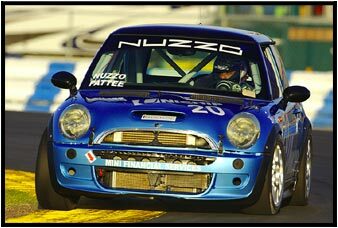 Nuzzo Motorsports, racing the #20 Unichip MINI Cooper S and #22 iRise/MINI USA MINI Cooper S at Daytona International Speedway, finished a satisfying 21st and 26th in class in Grand-Am Cup 200 in January. The cars, newly re-built to withstand the rigors of a 10-race 2006 Grand-Am Cup season, experienced niggling technical problems that negated the gains the team was able to make during the race. The #20 Unichip MINI Cooper S, qualified and started by team owner Tony Nuzzo, was in the midst of a steady climb though the field in the first half of the race. Nuzzo, who qualified the car in 13th position, gained five positions on the racetrack to hold the car in 8th place at the race's midway point. Nuzzo turned the controls over to teammate Steve Pattee, of Adel, IA, within the scheduled pitstop window of the race, but a transmission failure shortly thereafter left Pattee stuck in fourth gear throughout the rest of the race. "On a track that demands such a high level of aerodynamic grip, we felt that our MINIs have made huge progress since we last raced here," said team owner Tony Nuzzo. "We rebuilt the cars over the winter, and have added some modifications to the cars to improve their performance. We were pleasantly surprised to qualify mid-field and to maintain competitive lap times in practice and the race—Daytona is not a track where the MINI is in its’ element." Pattee, who along with Nuzzo claimed the first international podium finish for MINI at Watkins Glen in 2005, was forced to limp around the high-speed banking and sputter through Daytona's tight infield hairpins while stuck in 4th gear for more than an hour. Pattee resigned himself and his team to a points-focused race rather than aiming for another podium, but noted that he was still able to pass one car on the track, though limited to one of six available gears. "It was a disappointment for me to lose 4 of 6 gears so soon after getting in the car," he said, "but it was gratifying to chase down one of my competitors with that handicap. On a high note for the weekend, we were able to bring a new sponsor to the team—Unichip North America—and we had a successful time with them. They produce a piggyback ECU for street cars of all makes—MINIs included—and we'll be busy testing their product in our racecars before the next race at VIR." 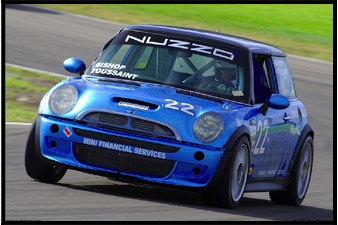 In the end, the Nuzzo Motorsports’ #20 Unichip MINI Cooper S finished 21st of 37 cars in the ST class, a remarkable achievement for a car that had a natural aerodynamic disadvantage at a track with such long high-speed sections, as well as a crippled transmission. The #22 iRise/MINI USA MINI Cooper S, piloted by Mitch Bishop and Joe Toussaint, experienced troubles as well, when a throttle cable broke in the opening laps of the race. After fixing the cable, the #22 car returned to finish the race. Mitch Bishop, son of legendary IMSA co-founder John Bishop, was happy with his long-planned return to the cockpit. After a lengthy layoff from racing, Bishop returned to the grid at Daytona and plans to run another 3 Grand-Am Cup races in 2006. "It was fantastic to get back in the car—I find that I've missed the competition a great deal," said Bishop, erstwhile Chief Marketing Officer at iRise, a software simulation company. "While I'm disappointed that I had to come to a rest on the track with the broken throttle cable, the experience just wets my appetite for more racing. I'll be glad to get back in the MINI again at VIR—it's a very fun car to race, and outperformed my expectations." Nuzzo Motorsports and Unichip North America race next at Virginia International Raceway April 21–23, 2006. Find out more about how to make your mini faster and more fun with the new flux, plug-and-play eCU by unichip!